We are fortunate to have many trees in our city and surrounding area. Trees and other plants oxygenate and purify the air we breathe. I value trees simply for their beauty; at this time of year I love to see their tall, slender, naked branches reaching for the sky, and I value the vibrancy of the ever-greens. Trees bring me comfort and peace. I am one of those people you may see hugging a tree on your walk through the park. Trees give the best hugs, try it, you’ll see. At this time of year there is very little wild medicine to be found. You can always dig through the snow in the forest and find goldthread roots and wintergreen leaves. Up above we have access to several trees offering winter medicine. My current favourite is the balsam fir. It is found all over Nova Scotia. In some places it is called “the church steeple” due to its upper spire-like form. It is widely used as a Christmas tree. It is easy to identify due to the raised resin blisters found on the trunk of young trees. The needles are flat, and are white underneath with a green line running through the middle. Balsam fir has a pleasant and stimulating scent which is released upon rubbing the branches. The resinous sap that oozes from the blisters is very tasty and fragrant. American First Nations people used it on cuts, burns and sores as an anti-septic and analgesic. The leaves are high in vitamin C, and are used in a tea for coughs, colds and asthma. I had the dry, persistent cough that was going around in January; finally it was a decoction of balsam twigs and marshmallow root that cured me. Balsam is a strong medicine; ¼ cup can be taken two-four times daily. It should be avoided by those with kidney disease and during pregnancy. White Pine is another of our medicinal trees. They grace our forests with their majestic height and branches that sing with the wind. 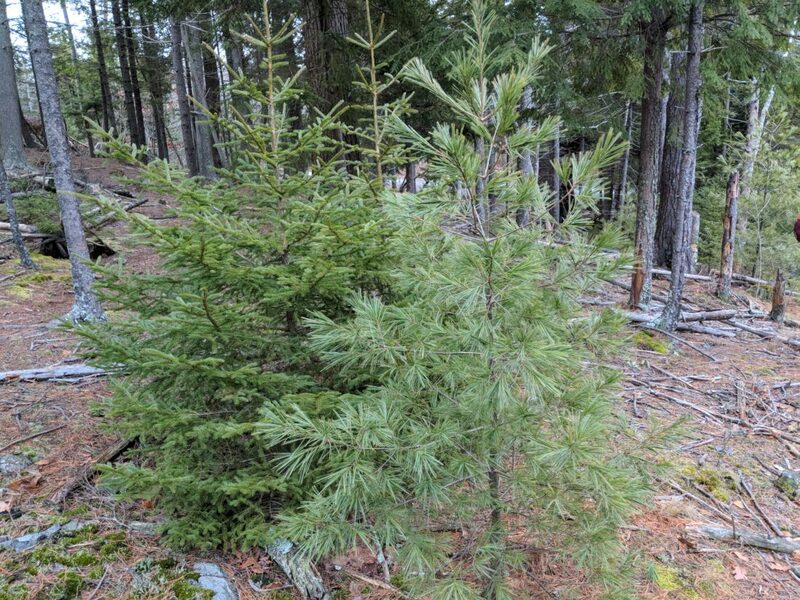 It is the tallest growing conifer in eastern Canada. The bottom 2/3 of the tree is often branchless. The long needles are grouped in clusters of five. This tree was used extensively by our first nations peoples. The pitch was used topically to draw out fluid and infection from abscesses and boils, for rheumatism, broken bones, cuts, bruises, and inflammation. The bark, needles and twigs can be steeped to make a tea for cough, colds, and sore throat. Like the balsam fir, the needles are rich in vitamin C. It would be far more sustainable if we derived our winter vitamin C from tree tea than from oranges imported from Florida!